An approved medicine for ye Spleen 221 Drink for three mornings together pure whey as it comes naturally from ye Curd: ye first morning two pints ye second morning three pints the third morning four pints the leest exercise after it is gentle riding. 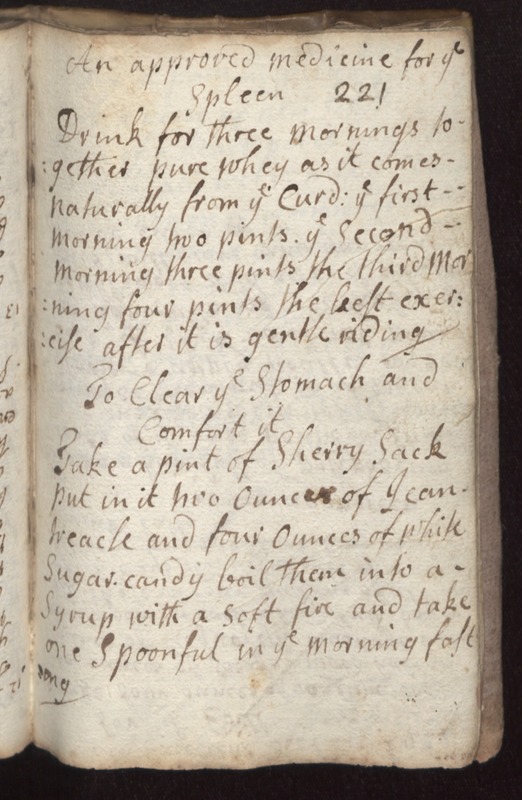 To Clear ye Stomach and Comfort it Take a pint of Sherry Sack put in it two Ounces of [Jean?] treacle and four Ounces of white Sugar candy boil them into a Syrup with a soft fire and take one Spoonful in ye morning fasting.